The Archos 605 WiFi portable media player offers mobility and power in a small device that carries more than what one might expect. It is equipped with a 30GB hard drive and a high resolution 4.3 screen equipped with touch screen technology. The screen displays images with 800 x 480 pixel clarity. As a portable media player, you may be able to play different types of digital entertainment using this device. Aside from watching movies, TV shows, displaying photos and listening to music using this device, the Archos 605 is Wi-Fi enabled to give you wireless connectivity to the online world. You may be able to stream and watch videos from your PC. You may also be able to download movies and music online by way of the Archos Content Portal where you may be able to get access to a wide variety of digital entertainment options. 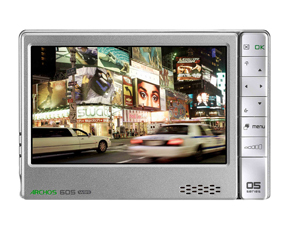 By looking at the Archos 605 WiFi, you would not consider it as a powerful portable media player because of its small size. Its great yet simple control features even make it more appealing to users who look for gadgets that provide easy to manage menus and features. Its battery life is also quite acceptable at providing power for 5.5 hours worth of video and 17 hours for audio.